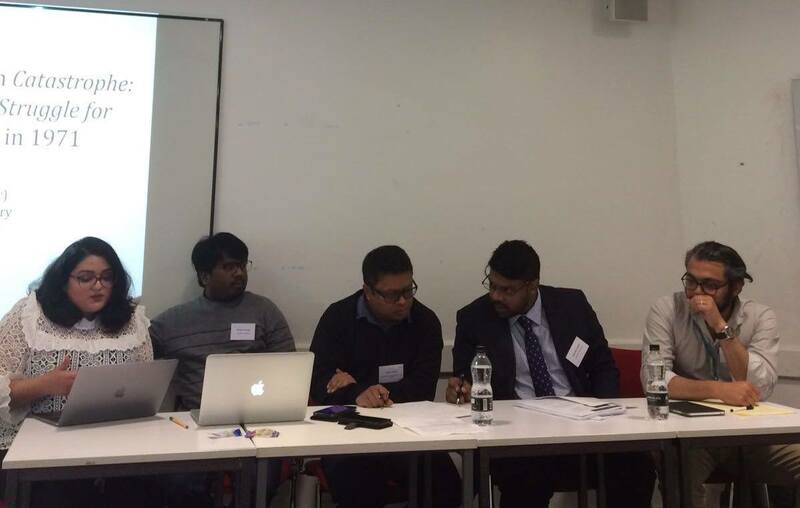 On 2 September 2017, a four-member panel of the International Crimes Strategy Forum (ICSF) chaired by the organisation’s Founder and Trustee Dr Rayhan Rashid presented three papers on Bangladesh at the Critical Legal Conference at the University of Warwick, UK. The other panel members included ICSF Trustee M Sanjeeb Hossain, and members Barrister Shah Ali Farhad, Muhsina Farhat and Bahzad Joarder. The exclusive panel was titled: “Anatomising a Forgotten Catastrophe – Bangladesh’s Historic Struggle for National Liberation in 1971”. Paper 1 presented by ICSF member Muhsina Farhat explored the cause of the catastrophe by discussing the exercise of the right of self-determination of the Bengali people in light of critiquing the report published by the International Commission of Jurists in 1972. Paper 2 presented by ICSF members Bahzad Joarder and Barrister Shah Ali Farhad focused on the nature of the catastrophe of 1971 and used it as a case study to explain the politics that shape and control the acknowledgement of international crimes like genocide and crimes against humanity. ICSF member Rokeya Chowdhury also worked on this paper. Paper 3 presented by ICSF Trustee M Sanjeeb Hossain used the International Crimes (Tribunals) Act 1973 and the International Crimes Tribunals of Bangladesh as case studies to argue that the current ‘institutionalised’ understanding of international criminal law marginalises other justice models that choose to prosecute adopting standards that are not identical to mainstream standards of international law. The attendees of the conference, for their originality and critical viewpoints, very well received the papers. A stimulating and engaging question and answer session followed the presentations where various aspects of Bangladesh’s founding history, the 1971 Genocide and the current justice process of the International Crimes Tribunal (ICT-BD) were discussed. ICSF is an independent global network of experts, justice advocates and organisations committed to end impunity for international crimes, ensure justice for the victims of these crimes, and uphold rule of law and human rights. Since its inception in 2009, ICSF has been campaigning for recognition and justice for 1971 Bangladesh Genocide through documentation, advocacy, research and education while at the same time supporting the justice process led the International Crimes Tribunals of Bangladesh.